The capital of Belarus is famous for its numerous bars and restaurants, where you can relax regardless of the size of your wallet. 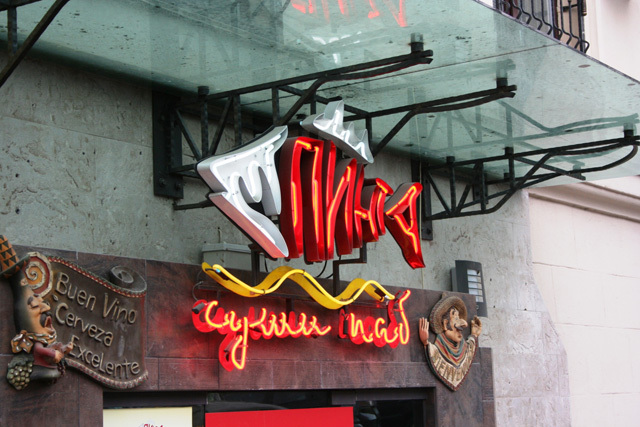 Minsk offers the city’s guests first-class gastro-pubs along with cozy inexpensive eateries, most of them located right in the city center, within walking distance of metro and parking. 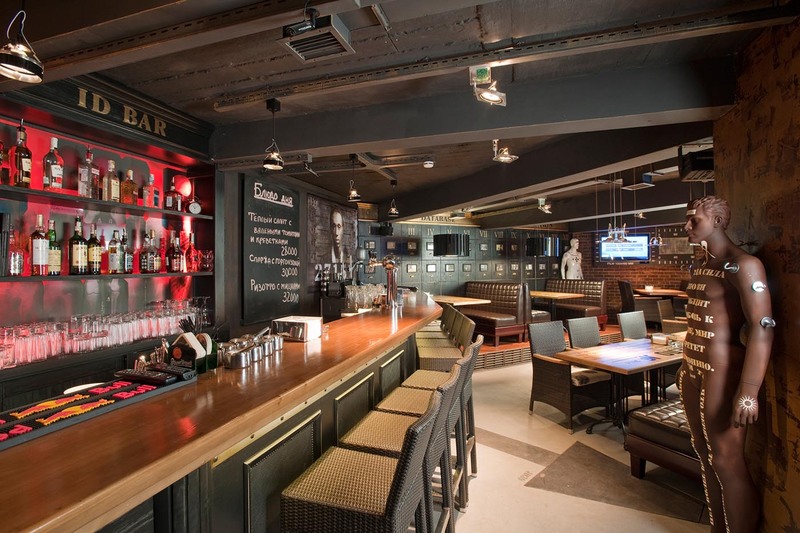 In this article we have gathered for you 10 top bars of the capital, where you can not only have a good rest, but also taste decent drinks: from author’s beer to collection varieties of wines. Can you consider yourself a fan of real rock and do not visit the bar «Doodah King»? That’s right, you can not. They come here to not just have a good rest and forget about cares. They come here to really break away. Despite the fact that the bar is small, it manages to combine in itself several styles of design. Creativity are felt in everything. At the core, of course, lies the style of American rock. There are also places for recreation: along the perimeter there are tables with comfortable sofas to take a breath to the next class song. The kitchen in the “Doodah King” is represented by dishes of Texan-Mexican, South American and Italian cuisines. That there is only fajitos with tender pork or a fragrant chicken in Mexican! In the bar menu the visitor will be offered a wide choice of beers, a line of standard cocktails and the opportunity to try a cocktail according to your own recipe. It does not matter which season is outside the window, in the cafe “SAD” is always warm and cozy. A relaxed atmosphere during the day and winding dances with wine at night – all this is “SAD”! For dances in “SAD” are answered by capital DJs who turn only vinyl. As for drinks for dancing, the wine and cocktail card was painstakingly developed by professional bartenders. At the same time, they pay attention not only to expensive wines, but offer guests to try out the available varieties of this unique beverage that are not inferior in taste. In addition, the waiters of “SAD” will be pleased to offer wines, combined with selected dishes. The kitchen in the restaurant is Italian, with its traditional, somewhere authentic, and somewhere authorically updated dishes. Having dinner in “SAD”, be sure to try the pasta and risotto. Pasta here “pull” themselves, and complement the taste of home-made noodles with both traditional fillings, and unusual. And it is not always possible to cook risotto correctly, but the chef of this institution does it perfectly. 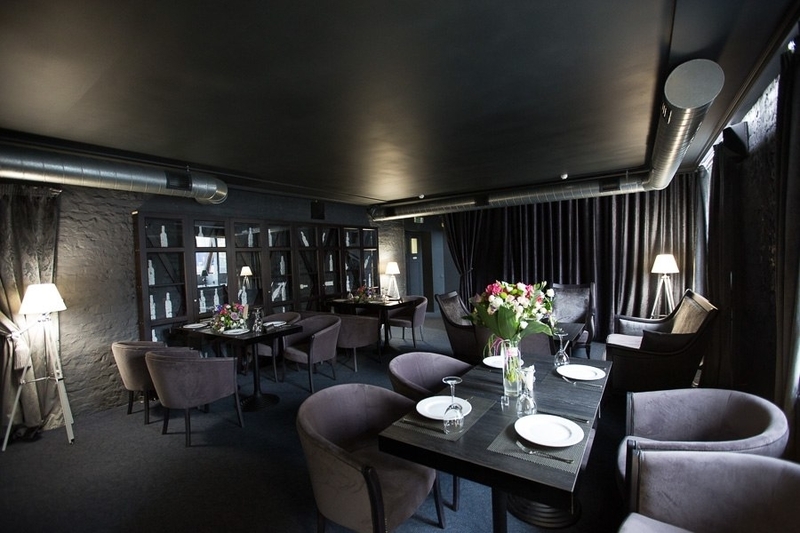 Restaurant with a fine, hearty and delicious European cuisine and a lot of varieties of foam. You can choose from 15 varieties of beer. And besides classical Czech, German, Irish, English and Belgian, visitors can try and seasonal varieties. The cuisine of the “Gvozd” is unique. This steak from marble beef you will not try anywhere in Minsk. And what kind of “Czech duck” and hunting sausages! “Gvozd” does not stand still and tries to constantly surprise its guests with new original recipes, the taste of which simply shakes. Beer from their own brewery, selected dishes of European cuisine in the author’s processing of the brand-chef, the atmosphere of the classic beer restaurant – all this about the “Staromestny pivovar”. If you look for a place for a rest in a warm company – this is one of the best options. The restaurant takes care of the traditions of brewing, the quality and culture of serving a foamy drink. Here, guests are offered only natural, tasty and fresh own beer. The institution offers several kinds of taste: light, dark and ruby ​​beer is always available. Regular seasonal varieties are brewed: Bavarian dark wheat ale, American pale ale, English brown ale, coffee stout, ginger beer. Seasonal varieties are always offered a special menu, the dishes from which best emphasize the style and set off the taste and aroma of the variety. In search of an excellent and hospitable place for unrestrained fun and a delicious dinner, it’s time to wander through the historic center of Minsk and look into the gastro gastro-pub “Gambrinus”. Immersed in a warm atmosphere from the first minutes, you can relax and get acquainted with this beer variety. There are more than one brand of bottled beer in the institution, as well as 13 varieties of draft beer. The name of the gastro-pub “Gambrinus” is not accidental. It is inspired by the rich biography of the valiant knight-duke of the 13th century, Jan Primus, better known as Gambrinus. Being an honorary member of the guild of brewers, he actively worked on the creation of new varieties of beer and hospitably promoted him to the masses, that’s why he was recognized as the patron of the Brewers and the king of beer all over the world! “Gambrinus” is divided into 4 rooms, transferring you to the beer capital of the world with the most vivid beer culture and traditions. 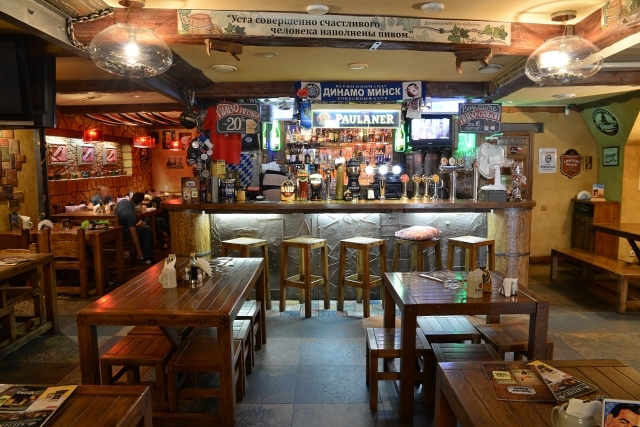 Bierkeller (literally means “beer cellar”) is a cozy corner of Germany in the quiet center of Minsk. In “BierKeller” you can try 8 varieties of draft beer. First of all, these are unique regional varieties, which you can enjoy in Belarus only here: the traditional Hacker-Pschorr KellerBier beer from Munich. In addition, our beer card is regularly updated due to seasonal varieties, the production of which is an old German tradition. 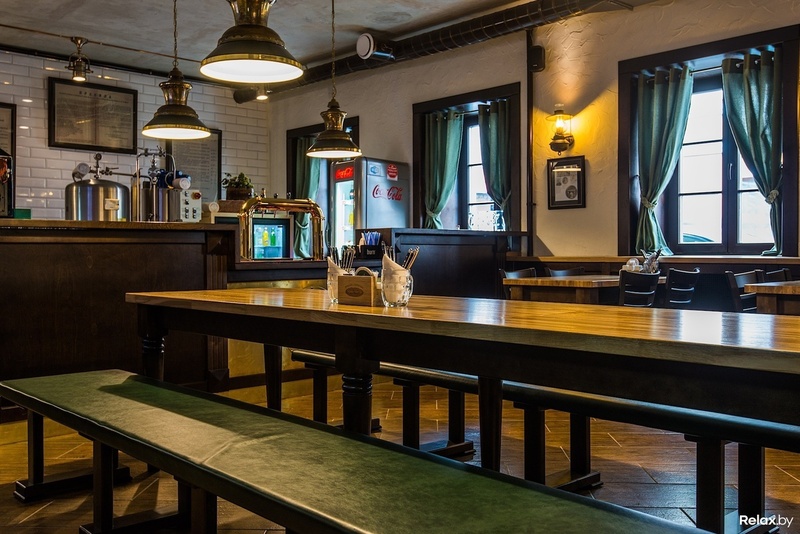 Here you will find the popular Munich varieties Paulaner and Hacker-Pschorr, and, as an exception, for the sake of the beautiful half of humanity – Belgian cherry beer Kriek. The menu is hearty dishes, mostly Bavarian cuisine, but the bar is not limited to this region. Here you will find all the German delicacies from a cheese assortment of soft German cheeses to a meat plate. In the menu of hot dishes, there are many traditional pork for Germany: both the pork breast, whelted in beer, and the schnitzel, and, of course, the amazing crisp crust, our centuries-old recipe was taught by our chef from a tavern Schlenkerla in Bamberg. And everything is traditional: large portions of mashed potatoes and stewed sauerkraut, a stylized feed! 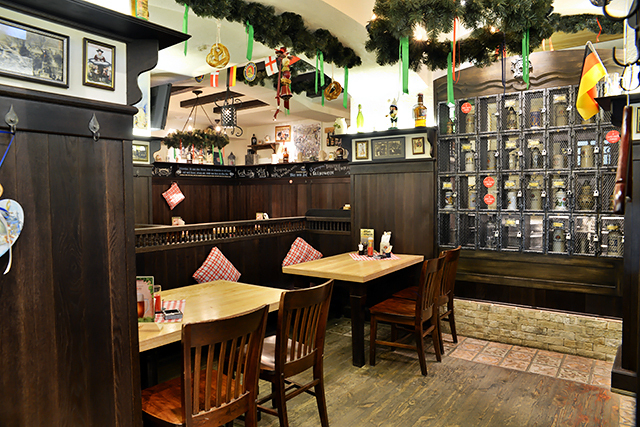 In addition to serving excellent beer and original cuisine, creating this small cozy restaurant, the creators wanted to transfer the soulful atmosphere of real German pubs, surrounded their guests with traditional interiors, authentic elements brought from trips to Germany, and most importantly – hospitable and caring staff! 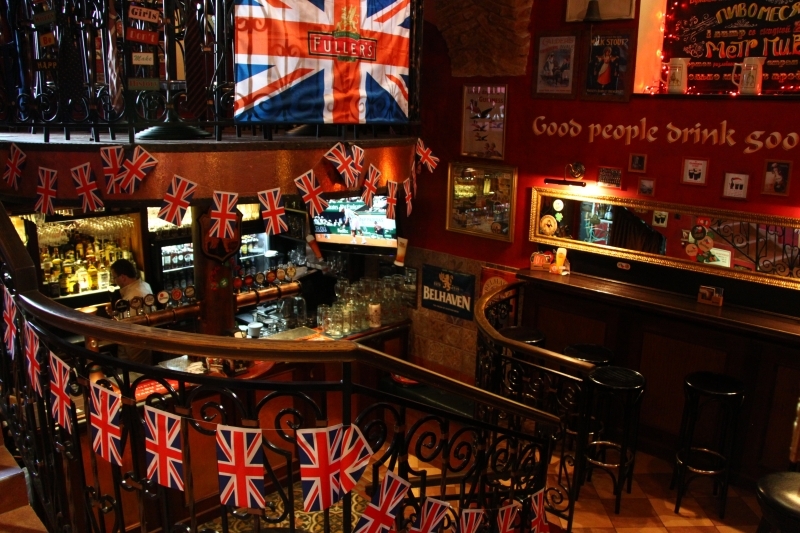 The pub in canonical English style is located in the very center of Minsk and is ready to treat its guests every day with delicious drinks and specialties. “Pinta” pleases with a combination of high quality service, decent cuisine and a wide range of cocktails for every taste. Exclusive interior “Pinta” allows you to hold an event of any format here. Muffled light and massive furniture create a special atmosphere of relaxation. The pride of the restaurant’s chef is branded fried sausages from juicy meat with own-made sauces. They are served garnishes for every taste, from stewed vegetables to traditional mashed potatoes. “Pinta” allows everyone to enjoy the rest and find their own format for themselves. 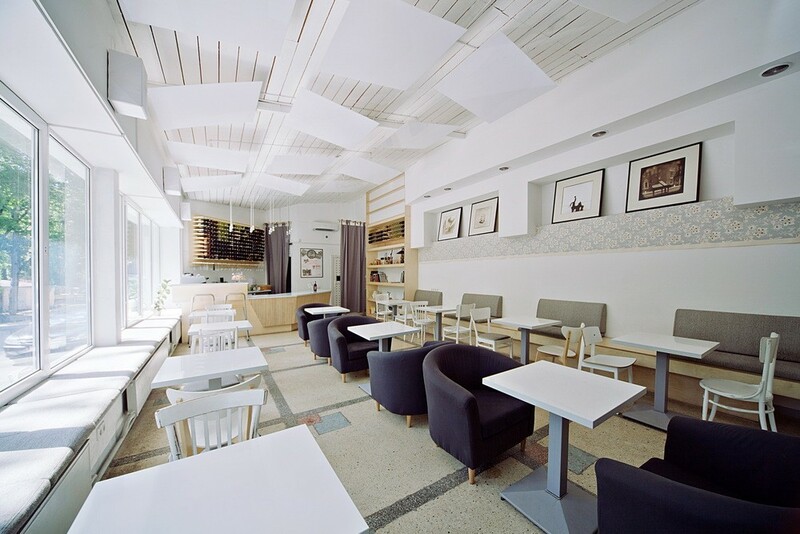 The “Ў bar” is the first wine bar in Minsk, where famous Belarusian artists, designers and writers gather. A tastefully composed wine list will help you to relax on a weekday or on a day off with a glass of good Italian, French or Spanish wine. The “Ў bar” menu will amaze with its restraint and harmony: it contains only light cheese and meat snacks, sandwiches, olives, tomatoes, crispy Italian bread ciabatta, several kinds of desserts – all that will reveal the aroma of wine and help to enjoy its taste. The “Ў bar” is democracy square: acceptable prices and the opportunity to talk about art are constantly attracting guests who know the value of a good rest. It will be pleasant to surprise the open manner of communication between bartenders and guests: there are no strict rules in the institution, therefore in the wine bar there is always a special home atmosphere and a friendly atmosphere. In general, this place is created for pleasant meetings with a cup of Italian coffee or a glass of wonderful red, white or pink wine! The key feature of this place is devotion to good taste and spontaneity. The idea is simple and so attractive to a truly discerning audience: a minimum of gloss and pathos, a maximum of spirituality and coziness. It’s always dynamic and interesting. Always especially. Undoubtedly, the main accent of the bar is alcoholic cards with wine and whiskey. In general, this is a world-famous classic: about 20 varieties of whiskey and the same number of types of wine. It is also important that the wine list is made up by a professional sommelier. It is relatively small, but carefully selected according to the features of the menu. In addition, in the plans it will be replenished taking into account the wishes of the guests of the bar. The bar saturated with a unique atmosphere. The most popular question that can sound in the ID bar: “Who are you?” And no matter from whose mouth it will sound, and maybe even in your head. The famous “you – what you eat” gets a new reading here. The bar menu features a mix of home and European cuisine with an Italian accent. ID bar is ready to offer homemade pasta and bread of its own production, steaks, desserts and much more. The main rule in the kitchen of the establishment is only useful and fresh products, prepared according to healthy technology. Also carefully selected and drinks for the alcohol ID card bar. Since the institution tends to develop a drinking culture, it offers exceptionally high-quality alcohol. In addition, to the drinks of the bar are supposed to compliment the institution. 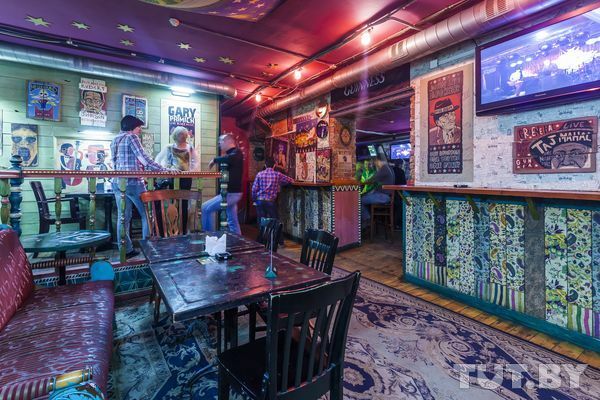 It was the top 10 best bars in Minsk, we hope that you find a place to your liking. 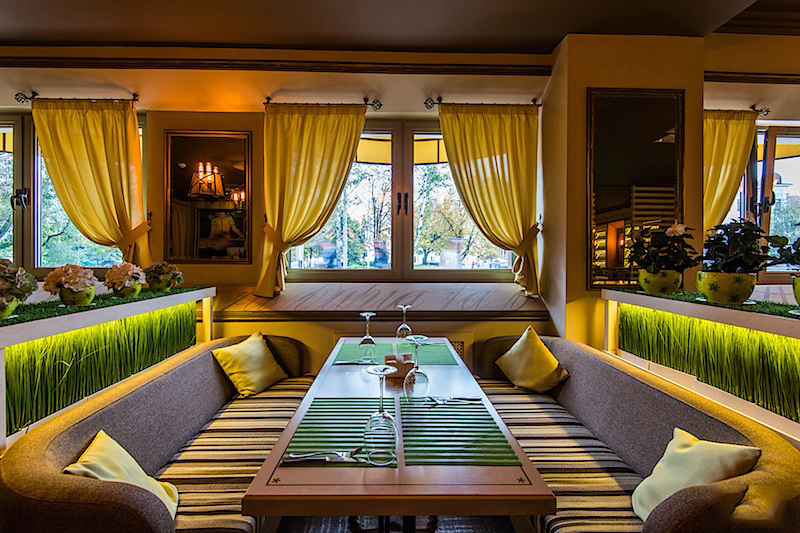 Do not forget to visit the best restaurants in Minsk and try the national dishes of Belarusian cuisine. We wish you a pleasant stay!